The way of practice involves the cultivation of the Noble Eightfold Path: the cultivation of virtue, concentration, and wisdom. This path provides a road map to freedom from dukkha [stress, anxiety]. I have been a Speech and Language therapist in school systems for the past 35 years, the last 25 in Fort Bragg, California. In 1991, the summer of my 50th birthday, I started Insight Meditation practice with pioneer Vipassana teacher, Ruth Denison, who was my heart teacher. Her teacher was U Bha Kin, a well-known and respected Burmese Meditation master. In the summer of 1991, I met Ajahn Amaro, a monk in the Thai Forest tradition of Ajahn Chah, who was a well-known and revered meditation master in Thailand. The present Thai Forest Monastic Tradition practices are most similar to the way that the Buddha taught his disciples 2500 years ago. In 1993 I was one of five people on the Mendocino Coast who started the Buddhist Sangha that met at the Caspar Childrens' Garden. It was a leaderless Sangha, and teachers of all lineages in the Buddhist traditions were invited to give talks. The Sangha met there from 1993 to 2010. 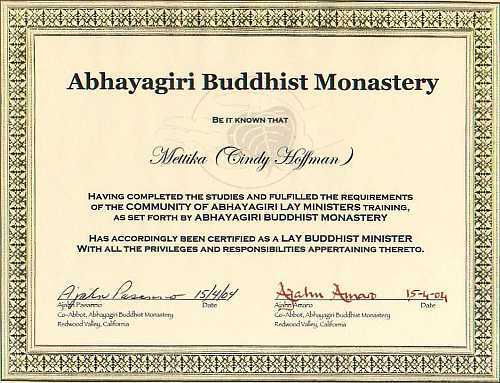 Abhayagiri Monastery opened in Redwood Valley, California, on June 1, 1996. It is the first monastery in the United States in the Thai Forest tradition. I have regularly attended and supported the Monastery since then. Ajahn Pasanno and Ajahn Amaro were co-abbots. They are my teachers in the Thai forest lineage of Ajahn Chah. They have inspired and encouraged study and pointed to the skillful means to put these teachings in practice. I wanted others to have the opportunity see, hear, and practice the Buddhist teachings. Thus, Three Jewels Hall was built in 1997 using straw bale construction. The following year I undertook the Upasika commitment as a lay person to Abhayagiri Monastery. Upasika means standing close by to the community. In 2001 I was invited to train at Abhayagiri as a lay minister. Our group of 13 from around the country and Canada was taught by Ajahn Pasanno and Ajahn Amaro, who were co-abbots at that time. When the training was completed in 2004, we were given permission to teach. 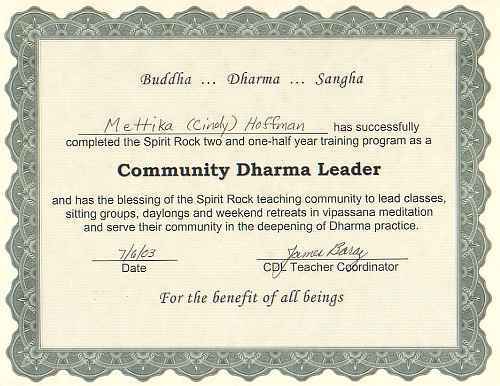 From 2001 to 2003, I trained in the Community Dharma Leaders' Program at Spirit Rock Meditation Center. At its conclusion in 2003, I received certification to teach. Since 2011, Three Jewels Sangha has been mentored by Ajahn Pasanno, abbot at Abhayagiri. A monk comes from the monastery every third Monday of the month and gives teachings. The other Mondays we listen to audio presentations, meditate, and have tea and inquiry. Three Jewels follows practices in the Thai Forest and Insight Meditation traditions. The Thai Forest tradition follows the original teachings of the Buddha, who said, ”I teach one thing only: the path that leads to the end of suffering."